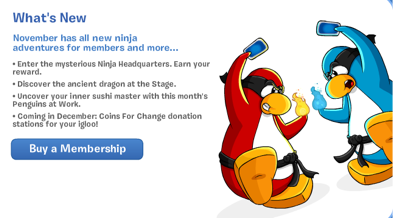 Club Penguin Cheats by Mimo777 Club Penguin Cheats by Mimo777: Club Penguin November Membership Page! Saweet! I always wanted to be a Sushi Master! How 'bout you? What are you most looking forward to in November? Lemme guess... Ice/Snow Ninja? AWESOMENESS ALERT! I got proof that we will be able to add klutzy & herbert (and probs dot, jet pack guy & rookie) as 'friends'! I sent an email to cp and they replied with "I think it's funny to when you try to search Klutzy or Herbert P Bear. Maybe someday we will be able to add them as friends!"!!! Sweet aint it! Jul112 PS anyone else got some proof like this? Does that mean they will make a Sushi Place? YAY YAY YAY!